British Vehicle Salvage Federation: How Much is Your Cat Worth? “Cat size is an app specially designed for dismantlers, garages/exhaust companies etc that get scrap catalytic converters and sell them on for processing. The processors tell the dismantler/garage the grade and price to match that grade but more often than not the grades are incorrect and the seller does not know whether they are selling their product at the right price or not. 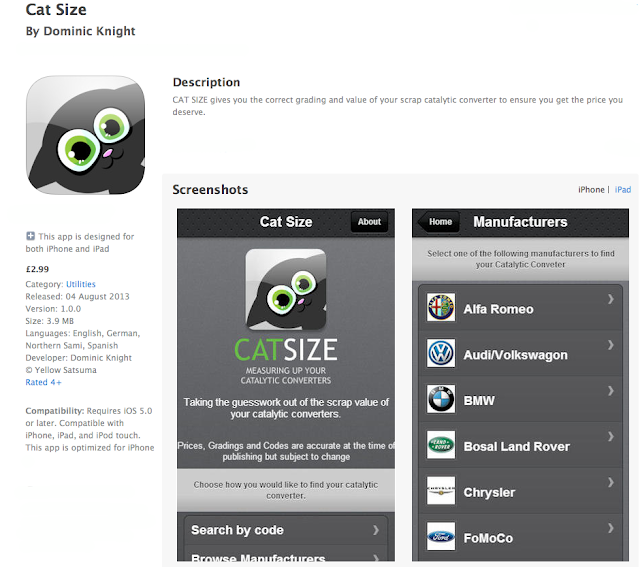 The cat-size app is available on iphone and ipad and it gives up to date grades and matching average prices for the cat and has a search option by manufacturer or by code which is updated on a daily basis. This is the app the buyers did not want the sellers to have and can be purchased through apple Apps or google Apps and a link from our website for just £2.99”.